Select the menu structure that should form the content of the menu. 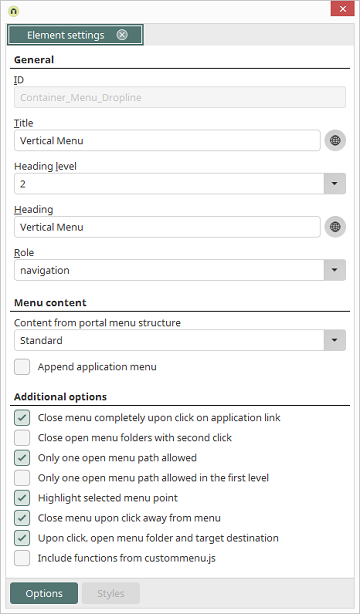 With this option, the pages, which are included in the application menu, are displayed as submenu items - provided the user has the appropriate permissions. Closes the entire menu when a menu item in an application menu is clicked on. If a menu folder is clicked on a second time, then it will be closed. Menu paths not currently selected are closed. In the first level, menu paths not currently selected are closed. Writes an additional class called "selected" that can be designed accordingly. The class can for example for used for special events. Closes the menu when the user clicks on a display area that does not belong to the menu. Opens the menu folder and the menu item's start page.